Biographies, bibliographies, and critical analyses of more than 135,000 authors from every age and literary discipline. Entries on 135,000 authors, from Contemporary Authors, Contemporary Authors New Revisions, Dictionary of Literary Biography, Contemporary Literary Criticism and other sources. More than 850,000 full-text articles, essays and reviews from 390 journals and magazines. More than 75,000 selected full-text critical essays and reviews from Contemporary Literary Criticism, Classical and Medieval Literature Criticism, Literature Criticism from 1400-1800, Nineteenth-Century Literature Criticism, Twentieth-Century Literary Criticism, as well as Drama Criticism, Poetry Criticism, Shakespearean Criticism, Short Story Criticism and Children's Literature Review. More than 11,000 overviews of frequently studied works, from sources including Gale's For Students series, Literature and Its Times and Characters in 20th-Century Fiction. 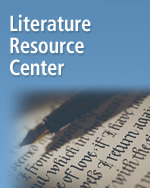 More than 30,000 full-text poems, short stories and plays. More than 6,000 links to web sites and 4,000 portraits. New and updated material is added continuously. Full support for these features is available from the More - Help menu inside Literature Resource Center.